There is nothing quite like a short break on a narrowboat holiday. You will discover one of Britain's best kept secrets, the network of waterways that meander across some of the most beautiful countryside, and past pubs, cottages and warehouses. This is a holiday of contrasts, taken at a slow pace. The variety is endless, city, town, village, and country, wide canal and narrow canal. Every bend of the canal brings forth some new delight, every mile some new feature. On the water, you are your own master ; this is a boating holiday where you dictate the pace. You can never see it all, no matter how many times you return. But why worry? Narrowboat holidays are for relaxation, for unwinding from everyday pressures, for doing what you like, when you like. With us you have the choice of over 230 boats running from 13 holiday centres, each with its own unique routes to help you discover a little more of this beautiful country of ours. The canals were built to carry Britain's goods 200 years ago, long before the advent of railways and motorways. Time moves on and, sadly, commercial boats have all but disappeared, but the waterways still retain their charm and character. Waterside pubs (the motorways cafes of the 19th century!) abound enabling boaters to stop and enjoy good meals or a quiet drink. Because of their age, the canals abound with interesting structures. In fact you will find more listed buildings on the canals than anywhere else in Britain. British Waterways, who look after the canals in this country, are very conscious of looking after their heritage and the improvements are all built so that they do not clash with the older environment. Most canals have towpaths that were used by the horses which pulled the boats. They are very pleasant to walk and are teaming with wild flowers and animals, but remember that ducks and swans expect to be fed ! You can also take bikes with you to use the towpaths and local bye-ways to explore the countryside around the canals. This is a real family holiday. 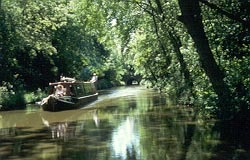 A canal boat holiday is leisurely enough to please Mum and Dad, whilst there is plenty for the children to see and do. In fact if they are into double figures, they will probably take over. They just love to drive the boats, under supervision of course (and where else could you do that ? ) If you have active children why not try a canal with plenty of locks and see how long it takes to master them. Everybody on the canal helps and talks to each other. It matters not whether you are a novice or an expert, a hirer or an owner, a walker or a canalman. One of the great things about the canals is the friendliness and camaraderie. Your boat comes fully equipped. All our boats have central heating, fridge, airing cupboard, cooker - in fact all the normal comforts of home. Bedding, crockery and cutlery are all provided so that all you need to bring is food and drink, and on some boats hand towels. Learning how to handle a narrowboat and working the locks is easier than you would expect. Boating is an inexact science and so nobody gets it right and so no-one gets it right all the time. But nobody worries and the boat is built to withstand all sorts of indiscretions. Remember, you will only be going at 4mph at full speed. A trained instructor will show you how the boat works and give you tips to help you. A comprehensive manual will be given to you, which remains with you on your holiday, and contains detailed information on the equipment and appliance. Useful telephone numbers are also included. This is a unique holiday. It is quite like anything else which you will ever experience, and it is interesting to know that four out of five people who try it for the first time get hooked, and come back again and again. Click here to Discover a secret Britain.